From diagnosis to treatment, our team of melanoma specialists utilize the latest technology and treatment protocols with a continued goal of positive outcomes and quality of life for each and every patient. Thank you for entrusting your health in our care. If you or a loved one is dealing with a diagnosis of melanoma, our multidisciplinary clinic- The Melanoma and Skin Center of Excellence has a comprehensive care team with some of the nation’s experts in melanoma at West Cancer Center & Research Institute to help you. We also want to provide you with resources and information to help you manage your melanoma diagnosis. 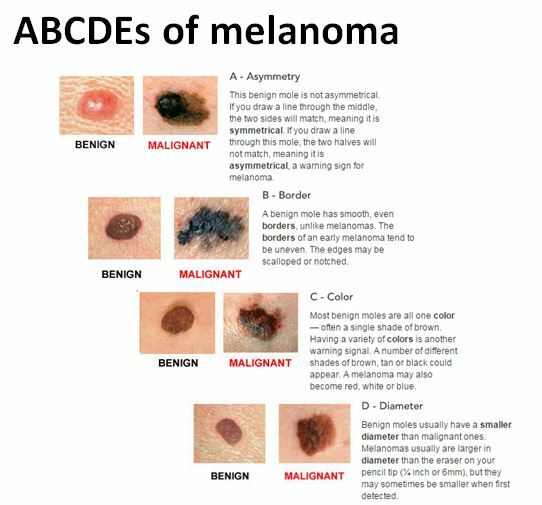 Melanoma is the most serious form of skin cancer that develops in the cells that produce melanin (the pigment that gives your skin color) Knowing the warning signs and seeking treatment early can provide successful results and help prevent spread to other parts of the body. Ocular Melanoma (OM) or uveal melanoma is the most common primary cancer of the eye in adults. Melanoma of the eye is markedly different than skin melanoma with different behavior characteristics. There are approximately 2,000 cases of OM diagnosed in the United States every year. In partnership with UT Hamilton Eye Institute, the Melanoma and Skin Cancer Center of Excellence treats over 100 cases of OM each year, one of the highest numbers in the country. Thickness of the tumor. The thickness of the tumor is measured from the surface of the skin to the deepest part of the tumor. 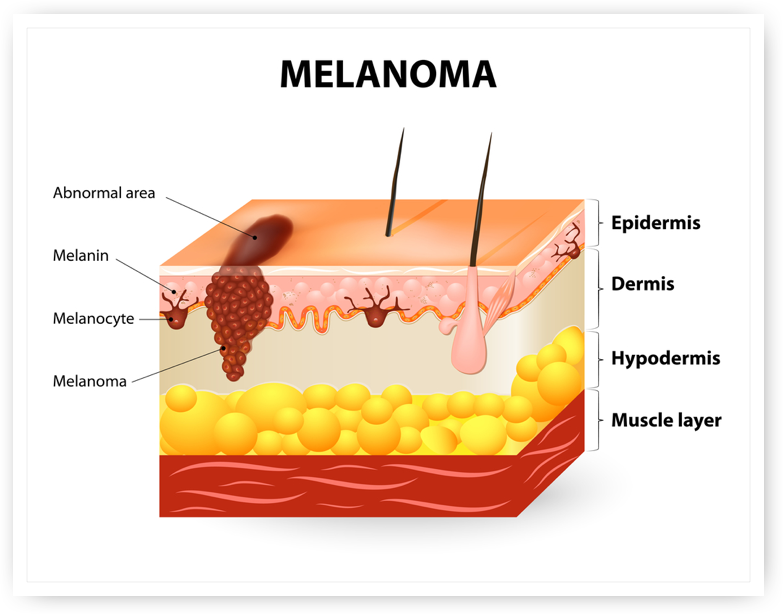 Abnormal melanocytes are found in the epidermis. These abnormal melanocytes may become cancer and spread into nearby normal tissue. 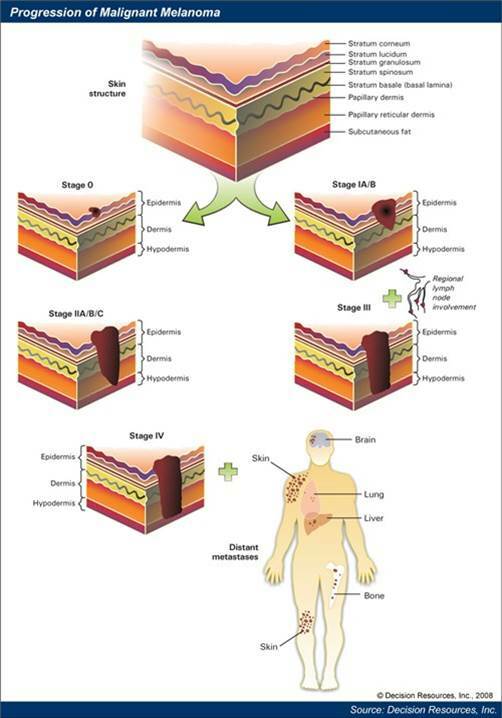 Stage 0 is also called melanoma in situ. The tumor is not more than 1 millimeter thick, with or without ulceration. The tumor is more than 1 but not more than 2 millimeters thick, without ulceration. The tumor is more than 4 millimeters thick, with ulceration. The tumor is not more than 1 millimeter thick, with ulceration, or not more than 2 millimeters thick, without ulceration. Cancer is found in 1 to 3 lymph nodes by sentinel lymph node biopsy. (1) It is not known where the cancer began or the primary tumor can no longer be seen, and one of the following is true: cancer is found in 1 lymph node by physical exam or imaging tests; or there are microsatellite tumors, satellite tumors, and/or in-transit metastases on or under the skin. or (2) The tumor is not more than 1 millimeter thick, with ulceration, or not more than 2 millimeters thick, without ulceration, and one of the following is true: cancer is found in 1 to 3 lymph nodes by physical exam or imaging tests; or there are microsatellite tumors, satellite tumors, and/or in-transit metastases on or under the skin. or (3) The tumor is more than 1 but not more than 2 millimeters thick, with ulceration, or more than 2 but not more than 4 millimeters thick, without ulceration, and one of the following is true: cancer is found in 1 to 3 lymph nodes; or there are microsatellite tumors, satellite tumors, and/or in-transit metastases on or under the skin. (1) It is not known where the cancer began, or the primary tumor can no longer be seen. Cancer is found: in 2 or 3 lymph nodes; or in 1 lymph node and there are microsatellite tumors, satellite tumors, and/or in-transit metastases on or under the skin; or in 4 or more lymph nodes, or in any number of lymph nodes that are matted together; or in 2 or more lymph nodes and/or in any number of lymph nodes that are matted together. There are microsatellite tumors, satellite tumors, and/or in-transit metastases on or under the skin. or (2) The tumor is not more than 2 millimeters thick, with or without ulceration, or not more than 4 millimeters thick, without ulceration. Cancer is found: in 1 lymph node and there are microsatellite tumors, satellite tumors, and/or in-transit metastases on or under the skin; or in 4 or more lymph nodes, or in any number of lymph nodes that are matted together; or in 2 or more lymph nodes and/or in any number of lymph nodes that are matted together. There are microsatellite tumors, satellite tumors, and/or in-transit metastases on or under the skin. or (3) The tumor is more than 2 but not more than 4 millimeters thick, with ulceration, or more than 4 millimeters thick, without ulceration. Cancer is found in 1 or more lymph nodes and/or in any number of lymph nodes that are matted together. There may be microsatellite tumors, satellite tumors, and/or in-transit metastases on or under the skin. or (4) The tumor is more than 4 millimeters thick, with ulceration. Cancer is found in 1 or more lymph nodes and/or there are microsatellite tumors, satellite tumors, and/or in-transit metastases on or under the skin. The tumor is more than 4 millimeters thick, with ulceration. Cancer is found: in 4 or more lymph nodes, or in any number of lymph nodes that are matted together; or in 2 or more lymph nodes and/or in any number of lymph nodes that are matted together. There are microsatellite tumors, satellite tumors, and/or in-transit metastases on or under the skin. The cancer has spread to other parts of the body, such as the lung, liver, brain, spinal cord, bone, soft tissue (including muscle), gastrointestinal (GI) tract, and/or distant lymph nodes. Cancer may have spread to places in the skin far away from where it first started. 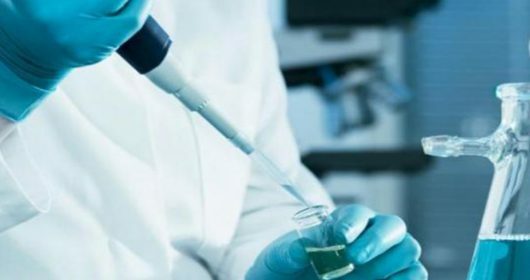 Removal and analysis of the most irregular part of the mole or growth. A circular tool is used to remove a round piece of skin around the mole or growth. Periodic skin exams by a physician, plus self-exams can help detect melanoma early. Usually used for small lesions in a cosmetically sensitive area with a razor blade. 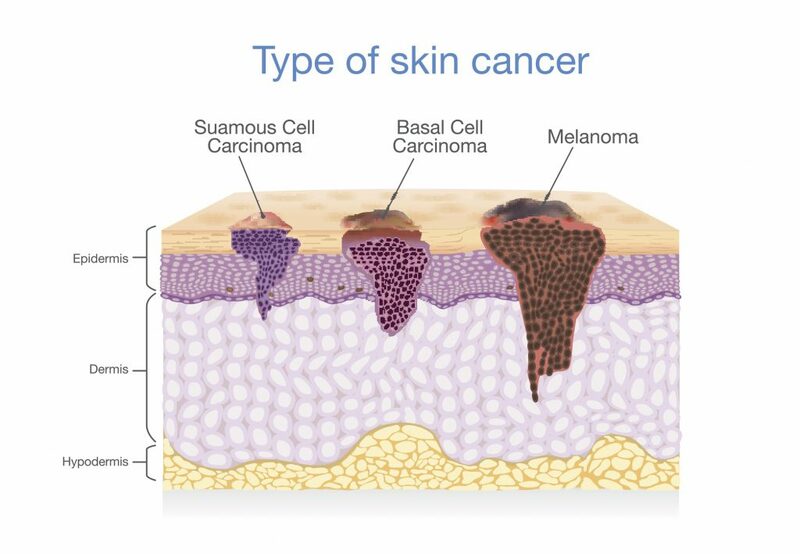 Your melanoma treatment plan will vary depending on multiple factors including, but not limited to, your stage of diagnosis, as well as the location of your cancer. Your dedicated team of cancer experts will discuss your treatment options and plan with you, allowing you and your loved ones to consider all possible treatment options for your diagnosis. You may be a candidate for a clinical trial for your skin cancer, ask our specialist if this is a treatment option for you. This surgery involves removing all of the lymph nodes around the primary melanoma. This procedure removes the sentinel nodes, the first place the cancer is likely to spread, to see if the cancer has spread from the skin. A surgeon will remove the tumor as well as a margin of normal appearing skin and underlying tissue.